Nagoya, Japan – All over the world, spectacular fossils have frequently been found preserved inside solid, roughly spherical rocks called "concretions." From geologists to casual observers, many have wondered why these hardened masses of carbonate formed around dead organisms, with round shapes and sharp boundaries with the surrounding material, typically in marine mud and mudstone. Several important questions regarding concretions have long puzzled scientists. What conditions cause them to form? How long do they take to grow? Why do they stop growing? Why are they so distinct from the surrounding rock or sediments? Now, researchers led by Nagoya University have developed a method to analyze concretions using L-shaped "cross-plot diagrams" of diffusion and growth rate, reported in a new study published in Scientific Reports. 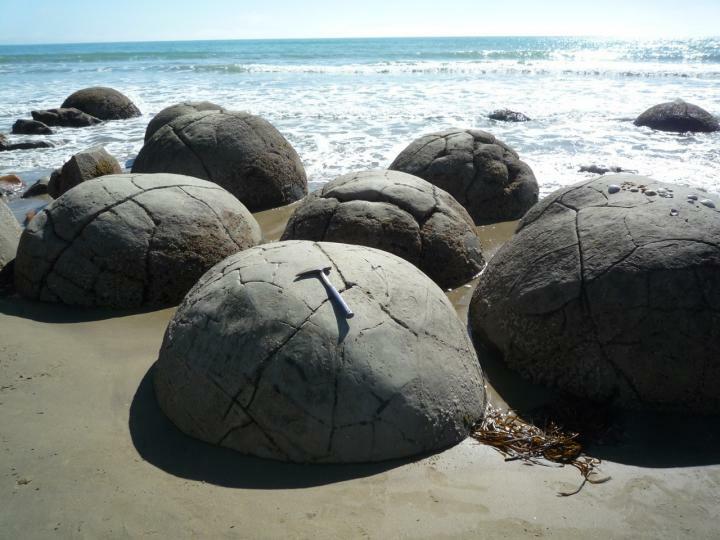 With this method, they analyzed dozens of concretions from three sites across Japan and compared them with concretions from England and New Zealand. The results of this new study dramatically impact understanding of the rate at which concretions form. "Until now, the formation of spherical carbonate concretions was thought to take hundreds of thousands to millions of years," co-author Koshi Yamamoto says. "However, our results show that concretions grow at a very fast rate over several months to several years." This rapid sealing mechanism could explain why some concretions contain well-preserved fossils of soft tissues that are rarely fossilized under other conditions. Study first author Hidekazu Yoshida explains, "The concretions maintained their characteristics, with well-preserved fossils at their centers or textures indicative of the original presence of organic matter. Simple mass balance calculations also demonstrate that the carbon fixed in the carbonate concretions came predominantly from the organs of organisms inside the concretions." All of the studied concretions were composed of calcite, with relatively consistent compositions throughout, distinct from the surrounding muddy matrix. Fine-grained, generally clay-rich sediments were found to be important to limit diffusion and permeability, and to slow the migration of solutes. Thus, bicarbonate concentrations would rise high enough at a reaction front to cause rapid precipitation of calcium carbonate, with sharp boundaries from the surrounding mud. This new unified model for the creation of spherical concretions, which can be generalized by simple formulas, can be applied to interpret concretions from all over the world. In addition to advancing our knowledge of this important preservation mechanism in the fossil record, this improved understanding of the rapid precipitation of calcite due to the presence of organic material may have practical applications in the field of sealing technology. The article, "Generalized conditions of spherical carbonate concretion formation around decaying organic matter in early diagenesis," was published in Scientific Reports at DOI: 10.1038/s41598-018-24205-5.